One might not readily connect playing the organ and ren­o­vating old cars with a sci­entist, but there happens to be an indi­vidual in Hillsdale College’s science department who fits this description. Ted Miller can often be found in the labs of the Stro­sacker Science Center, some­times whistling a tune. Miller — affec­tion­ately called “Mr. 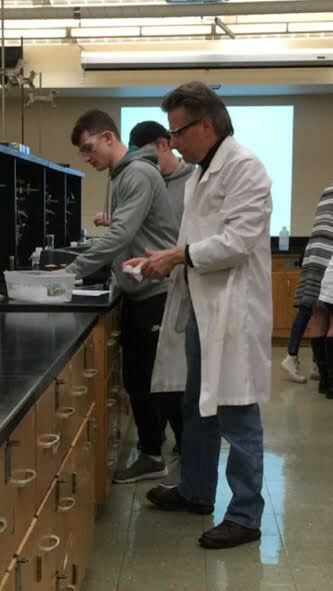 T” by faculty and stu­dents — has served as the director of Hillsdale College’s science labs for almost 15 years, and his respon­si­bil­ities include orga­ni­zation and cleaning, as well as prepa­ration and facil­i­tation for lab ses­sions. Miller spent about three decades with the Dow Chemical Company, where he has more than 20 patents. He also keeps up a YouTube channel, “kil­lar­neyguy,” which has over 100,000 views and a wide range of content. His love for science, he says, began during his school days in Detroit. Miller went on to study physics at the Uni­versity of Detroit, and he received his Master’s in bio­physics from Michigan State Uni­versity. Even­tually, he went into a PhD program, but after he and his wife, Cathie, had their first son, he inter­viewed for a position with the Dow Chemical Company in Midland, Michigan. Miller had his wisdom teeth removed before the interview, so he wasn’t himself going in. When the inter­viewer told him they were only looking for chemists and chemical engi­neers, not bio­physi­cists, Miller was upset because he had a solid back­ground in chem­istry. But all turned out well for him. In regards to his more than 20 patents with Dow, Miller says having a patent is like having children: You can’t pick a favorite because they all mean so much to you. Some of these patents are mea­surement tech­nology and instru­men­tation. In 2004, Miller saw retirement from Dow approaching, but he always loved the aca­demic envi­ronment, and he taught physics in the evenings, so he wrote to Frank Steiner, pro­fessor of biology and Grewcock Chair of the natural sci­ences. That phone call even­tually turned into a job offer, and Miller came to Hillsdale in 2005. His “com­bined role” is a mixture of teaching, lab man­agement, and over­seeing student employees in the lab. Miller is in charge of every lab com­ponent of the CHM 101 course. He has about 70 stu­dents each semester for the labs, which he says can be col­orful and give a physical com­ponent which allows stu­dents to gain insights into mol­e­cules. Miller says the duties he and his student assis­tants must perform aren’t always glam­orous. Gish is cur­rently a teaching assistant, but for her first three years at Hillsdale, she worked with Miller as a lab assistant. Gish says Miller is in tune with the lives and schedules of a Hillsdale student. He “demands a degree of excel­lence” from stu­dents’ work, but he’s always willing to work with stu­dents, espe­cially if they have a rough day or week. Pro­fessor of Chem­istry Lee Baron says Miller does an excellent job of keeping the department’s labs running smoothly. A key thing about him, she says, is that he makes sure every aspect of lab prepa­ration and main­te­nance is done properly. Gish and Baron both agree that “joyful” is an excellent description of Miller’s per­son­ality and the way he interacts with stu­dents and col­leagues. Gish says Miller is “one of the most vir­tuous and genuine people” she has been able to work for pro­fes­sionally. His kind and honest char­acter, she says, is a result of living out his faith pro­fes­sionally and socially. Baron says Miller’s joyful and kind attitude affects every­thing he does for the better. But Miller’s joy isn’t only applied to his work for the college. He brings his passion and enthu­siasm to his hobbies. Since growing up in Detroit, he has spent time buying and ren­o­vating old cars. Over the years, he has restored four Mer­cedes vehicles, and he posts videos of his cars — along with other zany content — on his YouTube channel, “kil­lar­neyguy.” In one of his videos, he drives a British 1954 MG with an inflatable Ronald Reagan as his pas­senger. He has sold cars to buyers in Cal­i­fornia, Florida, and even Belgium, a result, he said, of offers he couldn’t refuse. Growing up in the 50’s and 60’s, his father worked for Ford Motor Company. Miller recalls being excited about how the ’59 Fairlane would look. At that time, Miller got a job as a church organist to fund his love of fixing and ren­o­vating cars. Music never left his life, and he cur­rently serves as the organist for Redeemer Lutheran Church in Jackson. In addition, he directs a men’s choir on the side. What Miller loves about his job and hobbies espe­cially is the problem solving. With his job, Miller applies this love of finding solu­tions to every­thing from helping stu­dents dis­cover their career path or even grading lab reports. Baron says Miller is suc­cessful at what he does because he knows how to monitor stu­dents less and less until they are con­fident and inde­pendent in what they’re doing. That, she says, is the mark of a good edu­cator.